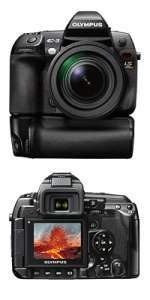 The new flagship of the Four Thirds Standard-based Olympus E-System. The E-3 gives photographers a high-performance tool that is primed for any assignment and satisfies the most stringent demands for D-SLR photography. It represents the ultimate choice for the professional photographer and provides the highest levels of speed and image quality as well as Live View capabilities and the ultimate in reliability. The E-3 features the world’s fastest auto-focusing speeds thanks to an advanced AF system and new ZUIKO DIGITAL SWD (Supersonic Wave Drive) lenses. Matched with shutter speeds of up to 1/8000th sec. and 5fps sequential shooting (with a 19 image RAW buffer in burst mode), the E-3 gives photographers a crucial edge to help capture that decisive shot. 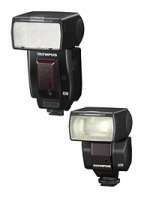 Forget dealing with cumbersome cables when wanting to get perfect lighting for your photographic subjects. Thanks to the new Olympus remote control (RC) wireless flash units FL-50R and FL-36R, cordless lighting set-ups are a convenient reality. Both are ideal for use with the Olympus E-3 professional D-SLR which enables the control of up to three different flash groups directly from the camera – no separate commander unit is required. Photographers benefit from extreme flash unit versatility and never again need to be hindered in the studio or in the field by troublesome wires. Extraordinary compactness, leading-edge technology and brilliant performance distinguish the new Olympus E-410 from the rest. 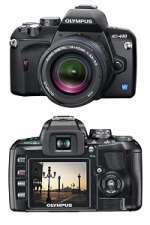 This successor to the E-400 is one of the world’s most compact D-SLRs with Live Preview. Photographers benefit from exceptional mobility and are not limited to only looking through the viewfinder when framing compositions – as is the case in most D-SLRs – but can also frame their subject directly on the large 2.5”/6.4cm HyperCrystal LCD. Thanks to compatibility with the Four Thirds Standard, a supreme selection of lenses and other accessories is at the disposal of users to extend the potential areas of application. Meanwhile, a new, professional-grade Live MOS sensor ensures 10 Megapixels of high-definition image recording under all conditions. 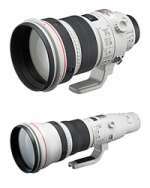 Canon today announced the development of two all-new telephoto lenses for use with its EOS SLR cameras: the EF200mm f/2L IS USM/ and the EF800mm f/5.6L IS USM/. The Company will exhibit prototypes of the new lenses at PhotoPlus Expo, taking place at the Jacob K. Javits Convention Center in New York City, October 18 to 20. After exactly one year from my last review of Portrait Professional I was once again asked to do a review of Anthropics Technology Portrait Professional 6 MAX software. Last version that I've tested left me in a bit of surprise because I never believed that a piece of software can replace a professional retoucher so fast. That version had some issues that I thought had to be corrected and let's see did Anthropics developer team did everything right with the new version of Portrait Pro 6. Samsung Unveils the New High-Performance Samsung Digimax L85 with the World’s First High Definition Multimedia Interface. 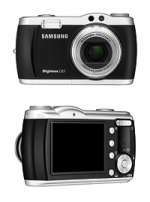 The new Digimax L85 is the latest addition to Samsung’s prestigious line of digital cameras. It is the world’s first digital still camera to feature High Definition Multimedia Interface (HDMI) - a revolutionary new feature allowing users to view their photos on a high definition television with outstanding quality. Set to launch in April, the eight-mega-pixel Digimax L85 also includes a top-class Schneider Kreuznach lens with 5x optical zoom and a 2.5-inch LCD display (approximately 230K pixels), which provides the photographer with a greater zoom options and a vivid display. Pentax Imaging Company announced the smc Pentax DA 18-250mm F3.5-6.3ED AL [IF] interchangeable zoom lens designed for exclusive use with Pentax digital SLR cameras. With an approximate 14X zoom ratio covering from wide-angle to super-telephoto ranges, this versatile lens handles a great variety of applications from wide-angle landscapes to close-up sporting events and wildlife photography. Pentax today announced the Optio V10, an ultra-slim compact digital camera equipped with a large 3.0 inch LCD monitor for enhanced usability and easy viewing. 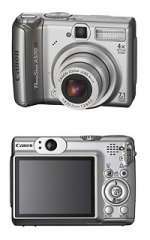 The Optio V10 features 8 megapixels, a 3X optical zoom and easy operations in a slim, stylish, affordable body. Pentax Imaging Company has announced the Pentax Optio A40, the latest model in the Optio A series of advanced compact digital cameras with superior image quality and performance. Featuring 12 megapixels, this latest Optio features three types of Shake Reduction including mechanical, digital and movie. Each version helps deliver sharp, blur-free shots where camera shake is an issue such as action photography or in low light conditions at dawn, dusk or at night. Smiles are infectious, seductive and a sign of happiness. But they can also be fleeting. Until now, capturing a smile at just the right instant was a serious challenge. Until now, that is, because Smile Shot from Olympus has solved the problem. Five new models feature this new scene mode that works with integrated Face Detection Technology to identify people in an image and then waits until they smile before taking a photo. Automatically, perfectly focused and exposed, and at precisely the right moment. 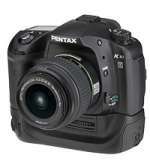 A PENTAX-developed Shake Reduction (SR) system that effectively offers a 2.5 to 4 stop advantage for sharp, blur-free images even under difficult shooting conditions, such as macro and telephoto photography or low light settings without a flash. The SR mechanism is designed to minimize camera shake by oscillating the CCD image sensor vertically and horizontally at high speed using magnetic force, while adjusting the speed of oscillation in proportion to the amount of camera shake detected by built-in sensors. 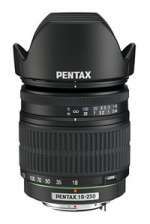 As a result, the system does not require special anti-shake lenses and can be used with more than 24 million PENTAX lenses produced since 1964. Although the line's "A" designation stands for the convenient AA batteries it accepts, it could easily stand for "affordable" or simply reflect the consistently high marks that these feature-packed PowerShot digital cameras earn from camera users and digital camera advocates alike. These two newest A-Series digital cameras continue to deliver on Canon's long-standing commitment to produce the highest quality cameras at the highest possible value to consumers. Indeed, Canon's A-series of cameras have long been heralded as a top-featured, entry-level line of digital cameras and rewarded with considerable consumer loyalty. Alien Skin Software, the award-winning developer of photographic filter and effect plug-ins for Adobe Photoshop and other compatible host programs, today announced the release of Exposure 2, the latest version of its industry-leading film stock simulator and effects package. Exposure 2 lets digital photographers and graphic artists enhance any digital photo by simulating the rich, organic look of film. Delkin's CompactFlash Pro UDMA enabled cards deliver industry-leading read/write speeds with a minimum sustained transfer speed of 305x (45MB/sec). The enhanced camera-to-card and card-to-computer transfer times considerably improve workflow for any pro photographer in the field. Hasselblad’s H3D line of products today achieve a new level of digital maturity and integration with the launch of the H3D-II, the fourth iteration of the camera system and one that can now justifiably lay claim to be the world’s finest digital SLR camera.Offering unsurpassed image quality delivered through an outstanding combination of hardware, software and lenses, the H3D-II is the clear leader in the high-end DSLR category, now a recognized segment of the photographic market. This premium photo printer provides both exceptional print speeds and spectacular photo lab quality. 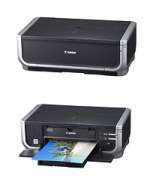 Print a photo lab quality 4”x6” borderless photo in approximately 21 seconds in Standard mode. Enjoy rapid borderless photo printing on a range of sizes. Other extensive features include advanced media handling, PC-free PictBridge camera direct printing and DVD/CD printing.